Arsenal midfielder Francis Coquelin has been ruled out for three months due to the knee injury he picked against Chelsea yesterday. Arsenal displayed an exceptional performance against Chelsea at the Emirates Stadium, they won the game by three goals to nil. The game gave several positives but also gave a big negative point which is the injury to star midfielder Francis Coquelin. 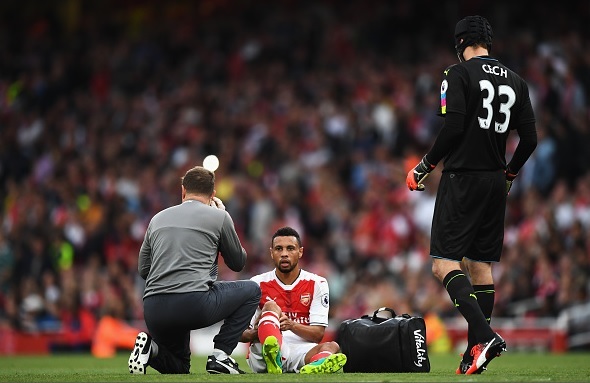 Coquelin picked up the same knee injury as of last year, and the reports confirm that he is expected to be out for atleast three months. Arsene Wenger confirmed: “He has a knee injury in the same place he had last year, that’s a negative of the day”. The French midfielder was replaced by Granit Xhaka on the 60th minute. Coquelin’s last year knee problem sidelined him for 11 weeks and now again he is going to miss the remainder of the first half of the season. He has now joined Per Mertesacker, Danny Welbeck and Carl Jenkinson on the sideline, they all are long term absentees. Xhaka who scored twice in the last three games for the Gunners is now going to get a name in the starting eleven alongside Santi Cazorla.